Every piece one creates, becomes like a child. Each one took time to create, may have faults, but one only sees it as something that has to stand independent of the person who created it. Some of my paintings I like, but others are okay and after a few years, I know I could have done them better, if I painted them today, so I use the back of them, as watercolor paper is expensive. Then there are a few which stand out. These are a few of my favorite pieces, which have won awards. Years later, despite my growth as an artist, I don't think I could improve on them. Sometimes, one is surprised by the subjective nature of awards, but I reproduce below the ones I painted, and thought that they were done to the best of my ability and which were recognized by the judges. 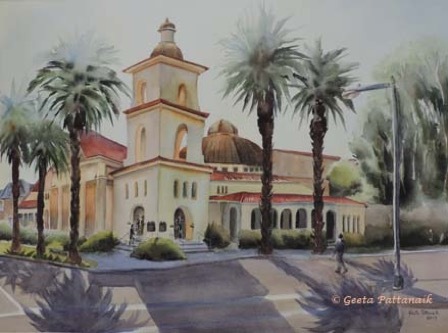 This is a very recent painting I did of a building in down town Riverside, California. It is in Watercolor 22" x 29". Ever since I moved here in 1991, I have remarked on the lovely proportions of the building and how beautiful it looks from each vantage point. One day I was walking around town looking at the lovely palms, which I paint regularly, as they are so much a part of the California landscape, when I stopped in my tracks. The building I so love, was backlit and seemed to glow from within, with the shadows stretching right across the intersection towards me. I have painted this church so many times, but this one is my favorite, because of the light and the shadows. It is done from my previous work, sketches and photos. I did the trees, just like I saw them, bleached out in part by the glare of the morning sun and just barely visible at the top, in certain places. I painted it negatively, having a puddle of water and working the different color paints outwards from there. Even in the short time since I painted it, this one has won some awards and many of my students keep asking me how I painted the palms. To me, the joy I feel seeing the depiction of the building is not just because I painted it so effortlessly, but also because of the response it evinces from those who have never ever seen the real thing. 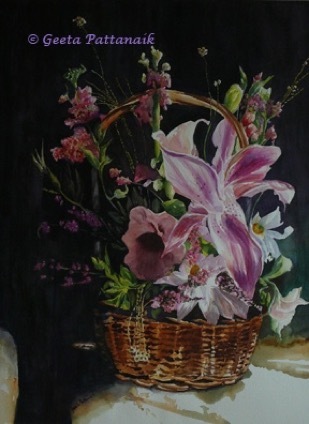 This watercolor painting I did was a Finalist in the Cover Design competition in 2011, in the Watercolor magazine. It was published with a writeup in a two page spread. I loved this piece as I mulled over it before deciding to paint it. It was a complicated subject, but came out exactly how I had wanted it. I wanted it to be emerging from the darkness behind with a chiaroscuro effect, and the blooms shown in all their glory. I basically eliminated the background for this reason. This painting of mine was a winner in the 8th Annual Paint the Parks competition and will be in a traveling exhibit, which will go to various places in the U.S. It was of a view in Yosemite National Park, and had some unique elements in the view, which I tried to highlight in the painting. 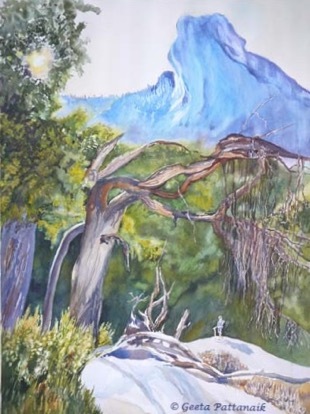 The background mountain was a towering and unusual shape, the trees in the front drooped down like an old man's beard, but the person in the painting was there for showing the scale of the scene, and he was placed in the distance to make it seem timeless, rather than a modern day person. I also tried to paint the sun shining through the trees, by creating a halo in the top left. The rocks at the bottom were sparsely painted to give the eyes somewhere to rest. This large drawing has won a few awards. 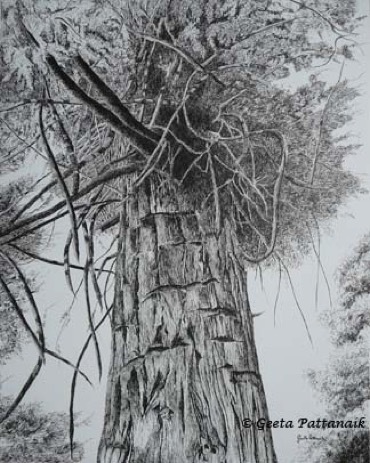 It is a pen and ink drawing of a very huge tree near The Arts Colony in Corona. I had observed it in various seasons, and was sure I wanted to paint it, but looking at the details in the tree, I thought it would be a challenge to draw it in all its complexity. I had several photos, and drew it in pencil first, with just dots and dashes, then went in to do the trunk and front branches first. The next was the placement of the branches behind, as they weave in and out of the ones in front. Lots of left and right brain stuff here. It took me about 5 - 7 hours a day for about 10 days to complete. I loved doing this piece and look at the original tree sometimes, as though I have a special connection with it, which I do.